Looking for a great landscaping job? It's a good thing you're here. Tina Czysz has all the pro tips you need. Czysz is director of human resources at Greenscape Inc., responsible for recruiting and hiring qualified job candidates, as well as employee retention and development. She'll tell you where to look, share tips for applying and interviewing and wrap it all up with a few follow-up dos and don'ts. 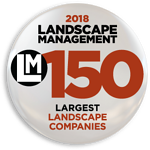 Ready to land the best landscaping job? There’s no shortage of job-hunting sites that might have a lead for you: Indeed, Glassdoor, ZipRecruiter. “A lot of people are turning to social media, so check LinkedIn and Facebook,” Czysz says. Visit landscaping industry sites, she suggests, like horticulturaljobs.com and ihirelandscaping.com. But her best tip: Go right to the source. “One of the easiest ways is to Google landscaping companies in your area and check out their websites,” she says. “We’ve made some of our best hires because they just walked in the door,” Czysz says. “We’ve hired people for positions we didn’t really have open, or for jobs we didn’t even realize we needed, because they walked in the door with attributes and skill sets we knew we wanted. We figured out how to make it work. “A hand shake and a one on one interview is still my preference,” she says. “If you approach one of my employees any day and ask them if we’re hiring, they’ll tell you yes,” she says. Ask everybody you know, she says. Some companies have pre-screening questions on their application that could disqualify you from a job, Czysz says. But when you come across these questions, answer them honestly, she says. Some questions are to make sure you’re actually able to do the work. Are you 18 or older? Do you have a valid driver’s license? Are you physically able to work in the heat and be on your feet for nine hours? Other questions are about the company’s culture. They might ask if you’re a team player, or if you prefer to work alone. Answer everything honestly, she says. Any fibs will catch up to you in an interview. Or you might end up in a job that’s really not a good fit for you. When you apply, really think hard about things you’ve done that will impress an employer, Czysz says. “If you’re applying for a foreman job, you should include your previous professional experience — not mowing your grandmother’s lawn,” she says. If the application asks if you’ve had at least two years of landscaping experience, don’t say yes if the answer is really no, she says. “Don’t smoke before an interview,” Czysz says. “The smell of cigarette smoke is a turnoff." “Dress for the job you want, not the one you’re interviewing for now,” she says. When the interviewer asks you if you have questions, you better have some, Czysz says. “You wouldn’t believe how many people say ‘Nope,’” she says. Wrong answer. Ask for your interviewer’s business card so you can follow up with an email later. 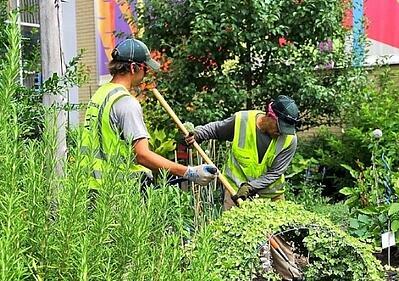 The best landscaping jobs are only great if they’re a good fit for you. Don’t forget: job hunting is a two-way street. What is it really like to work there? “Look for things that make you feel warm and fuzzy," Czysz says. Are there team photos on the website? Does the company give back to the community? “What opportunities are there to be involved in the bigger picture?" A job at Greenscape — no matter what the position — starts with a commitment to the five core values that guide the company and its people. What percentage of employees are promoted? Is there promotion from within, or do they always hire from outside? 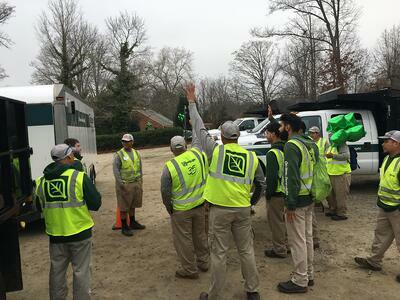 The best landscaping jobs help you move up and grow in the company. “Knowledge is power,” Czysz says, “and power gives you opportunities. You're back in your car, taking a few deep breaths after your job interview. You really want this job. Follow up via email or with a short phone call, Czysz says. Tell them if you’re interested in moving forward. But don't be a pest. “I don't want someone calling me every day,” she says. At Greenscape, Inc, we’re proud of our culture, values, opportunities for growth and great challenges. We’d love to tell you more. Ask us anything. 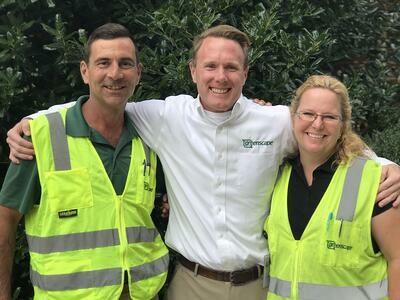 We’ve been meeting the full-service landscaping needs of commercial customers in the Raleigh, Durham, Chapel Hill and Cary areas for more than 35 years. We couldn't offer our award-winning services without top-notch employees.